“Our main goal is to preserve the forest according to the customary traditions of our people. If there’s no forest, there’s no Orang Rimba and the other way round,” says Bepak Pengusai, head of customs in arombong, or group area, belonging to the Orang Rimba, an aboriginal people in Sumatra. Indonesia’s devastating forest fires pose a serious threat to the Orang Rimba habitat. From July to late last year, the fires killed a dozen people and caused respiratory tract infections in half a million more. Every year, landowners start fires to clear ground for farming, but last year a seasonal drought spread the blazes with catastrophic effect. The emissions from the fires were so toxic they catapulted Indonesia to the top of the world rankings of air polluters. On the islands of Borneo and Sumatra, indigenous communities including the Orang Rimba were hard hit. The fires also threatened endangered species, such as the orangutan. The Orang Rimba, which means people of the jungle in the Bahasa language, comprise about 2,000 aborigines from Jambi province in central Sumatra. Their territory extends across 60,000 hectares (148,000 acres), according to theconservation group Warsi. Traditionally inhabiting rainforest as hunter-gatherers, their animist beliefs centre on protecting nature as their only source of sustenance. However, the expansion of corporate plantations and slash-and-burn land clearance have gradually pushed out the 11 tribes that make up this community from Jambi’s Bukit Duabelas national park, which has shrunk by an estimated 30% in the last decade, according to Indonesian anthropologist Butet Manurung, who is a specialist in the Orang Rimba and their habitat. “The government tries to blame indigenous peoples and fails to punish the companies that provoke fires,” says Rukka Sombolinggi, deputy secretary general at the Indigenous People’s Alliance of the Archipelago (Aman in Bahasa). In October, President Joko Widodo announced new housing for the Orang Rimba on 2,500 hectares of forest in Jambi following a meeting with tribal leaders – the first one organised by an Indonesian head of state. But Bepak Pengusai says the housing will not solve the existential challenges facing his people, and argues that overexploitation of the rainforest is the root cause of the fires. “We don’t refuse assistance from outside if it benefits us, because we know we can’t fight modernity ourselves and alone. But the jungle belongs to the Orang Rimba,” he says. Sombolinggi rejected the president’s offer of housing. According to a recent World Bank study, the forest fires will cost Indonesia an estimated $26bn – 1.9% of its gross domestic product, or more than twice the post-2004 tsunami reconstruction costs. 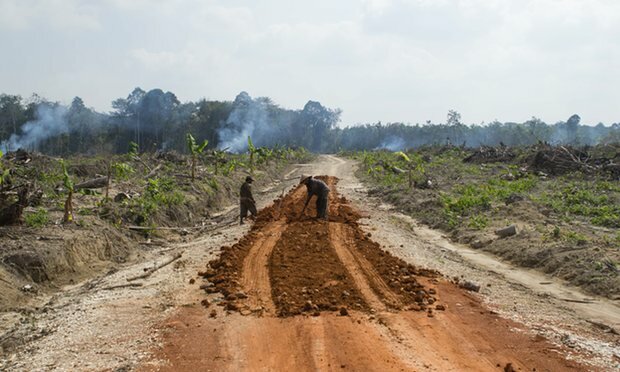 Neither the sustainable palm oil initiative nor repeated – and breached – moratoriums on land clearance have sufficiently protected Indonesian natural resources. Aman says the Orang Rimba are already on the brink of extinction mainly because of the exploitation of their traditional lands. Vast areas of rainforest have been converted into monoculture plantations. Beginning with concessions granted by former President Suharto to fuel political patronage (pdf), forests were used as industrial plantations for timber, rubber and palm oil once the hardwoods had been depleted. Indonesia is the world’s largest palm oil exporter and has doubled its production to 23m tonnes in less than a decade, according to government records (pdf). The sector is an important source of government revenue, generating $12.4bn in foreign exchange from exports. 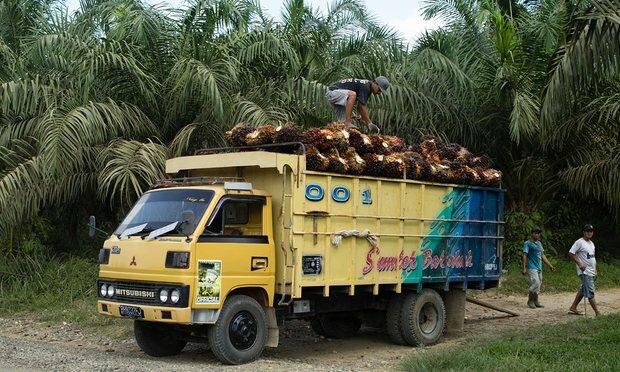 However, only 0.5% of the 10m hectares of palm oil plantations belong to the state (pdf), while the rest is owned by smallholders and the private sector. “We noted more than 730 conflicts between palm oil companies and communities [since 1998],” says Agustinus Karlo Lumban Raja, head of the environmental department at Sawit Watch, a national network of smallholders and communities that advocates stopping palm oil expansion, especially in Sumatra, where most of the concessions are located. “Most of them are related to unclear and unfair land acquisition, land grabbing, criminalisation, unfair partnerships and labour issues,” Lumban Raja added. In 2013, Indonesia’s constitutional court ruled in favour (pdf) of indigenous peoples’ rights over the forests where they lived. But Sombolinggi says the government continues to award concessions to private companies without the consent of indigenous peoples, while evicting tribes from protected areas. As well as being neglected by the government, the Orang Rimba are preyed upon by corporations that take advantage of widespread illiteracy. Organisations including Warsi have recorded instances of Orang Rimba being encouraged to sign land agreements that they could not read. Widodo has promised to pass a long-delayed draft law on indigenous rights. But until then, the Orang Rimba face the prospect of struggling alone against corporate interests. “Palm oil workers burned the house of an Orang Rimba a couple of years ago. So 500 members ran away and were found hiding in the forest,” recalls 27-year-old Pengendum Tampung, leader of the United Makekal Group (KMB, in Bahasa). KMB has mapped the jungle and prevented the expansion of plantations in certain areas by denouncing illegal practices. Tampung’s organisation is made up of current and former students from Sokola Rimba (Rimba School), an innovative project that educates indigenous people to help them cope with modernity. Set up by Manurung, the initiative has spread literacy to more than 300 Orang Rimba, with the aim of preventing them being cheated of their land. Tampung, who thinks improvements in transport links would be more useful for Orang Rimba than housing, says the rights of his people must be protected.